A collection of flower Vessels created on the wheel in stoneware and porcelain. 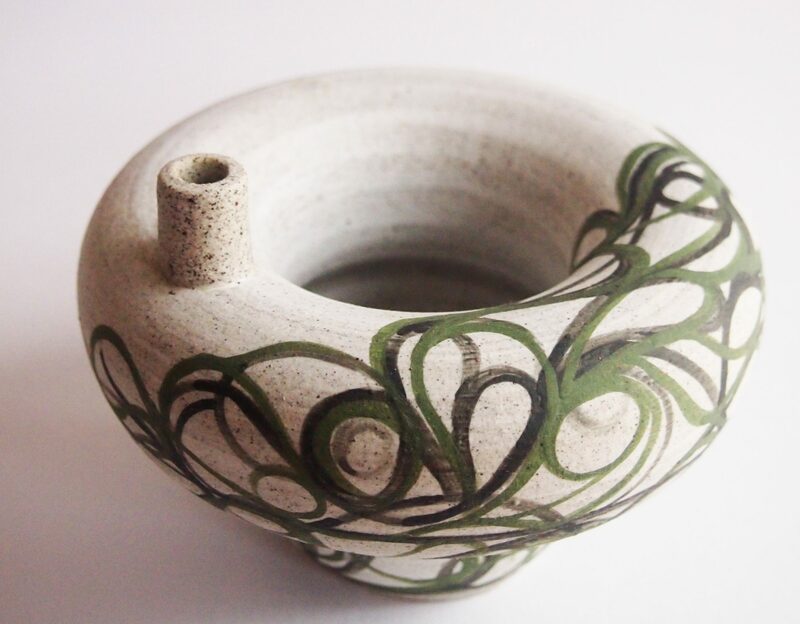 Each vessel is a composite form using torus forms (clay donut) and bowl/plinth forms. A series of holes suitable for ikebana style floral displays. Decorated with a green slip engobe. A vessel inspired by organic forms made to showcase and nurture flowers. A small wheel thrown vessel, decorated with black porcelain slip. Inspired by the ‘Beaker’ tradition of the Neolithic/ Bronze Age. ….and they can also hold big beautiful blooms. What a difference can be achieved with a change in context for each photograph. How does a background and addition of flowers change the focus for this pot? From Ancient to ‘Old Dutch Master’ inspired? How different does it look with a white background? Contemporary use of materials with a traditional black pottery form. The use of photographic conventions does make a difference to your work? When does the photography mean more than the work itself? If someone said ‘the photo does not do the work justice’ is that better than…’it looked great in photographs’? How does one keep a discerning eye? Or is it not important? Is it ‘smoke and mirrors’ ….a bit ‘Emperor’s New Clothes’? Is it an art form beyond the pot? What is the Art your selling? What does the buyer get? Personally the images of the pot with the black background, says the most to me. It is more inline with what I hoped the Pot embraced? A new pair of ‘Contrasting Pairs’ are fresh from the kiln. They are slowly revealing their story to me…..firstly it was about looking into contrasts. Which is easy, change in form, surface, colour but more deeply and on reflection I’m beginning to see more and I look forward to expanding on this idea and sharing more soon. In the meantime….these are in the SHOP. A trio of delicate porcelain vessels in pink. A pale, creamy speckled glazed interior with fine inlay lines, a subtle contrast. This trio of polished, translucent porcelain vessels are available here. A new collection of wheel thrown porcelain bangles decorated with inlay. This year my practice will be looking into ‘Contrasts’. A study of contrasts in form, surface, texture and colour. Contrasts the delicate and the strong, fragility and strength, dark and light.